File contains two typsecript pages outlining the genealogy of the Chard Family of Rawdon Township, 1787-1964. 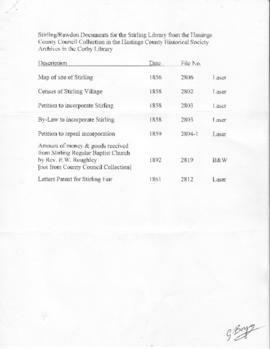 File contains several manuscript and typescript memoranda and correspondence concerning the history of Hastings County by C. S. Chard of Stirling as related by his ancestors. File contains an original printed and manuscript deed of sale of land to Perlee Chard, Rawdon Township. File contains a 1924 obituary for Honourable J.R. Cooke of Stirling. File contains an 1859 Hastings County petition to approve Mr. Brown as local Superintendent of Education in Rawdon. File contains a newspaper clipping about an auction held in Stirling to auction 29 schools from the Huntingdon, Hungerford, and Rawdon area - $72,000 was raised for the school board. File contains a newspaper clipping regarding underwater fishing activities by local skin divers Gary Cranston and George Woodhouse, Sportsmen Helldivers Club, in Oak Lake in July, 1959. File contains a newspaper article concerning the renovation and reopening of the Rylstone country store which was established by William T. Bateman ca. 1862. Scrapbook of news clipping relating to people in the Rawdon area of Hastings County, Ontario. Includes announcements of births, marriages and deaths and reports on people serving in the Second World War. Compiled by Eileen MacMullen. File contains a one page printed completed letters patent form authorizing the establishment of semi-annual fairs in the Village of Stirling, issued by the Province of Canada, 15 November 1861.